1. the feeling that what is wanted can be had or that events will turn out for the best: to give up hope. 2. a particular instance of this feeling: the hope of winning. 3. grounds for this feeling in a particular instance: There is little or no hope of his recovery. 4. a person or thing in which expectations are centered: The medicine was her last hope. 5. something that is hoped for: Her forgiveness is my constant hope. verb (used with object), hoped, hoping. 6. to look forward to with desire and reasonable confidence. 7. to believe, desire, or trust: I hope that my work will be satisfactory. verb (used without object), hoped, hoping. 8. to feel that something desired may happen: We hope for an early spring. 9. Archaic. to place trust; rely (usually followed by in). For hundreds of people in a small city in western South Dakota, hope is a little brick building downtown. It’s a place called the HOPE Center. 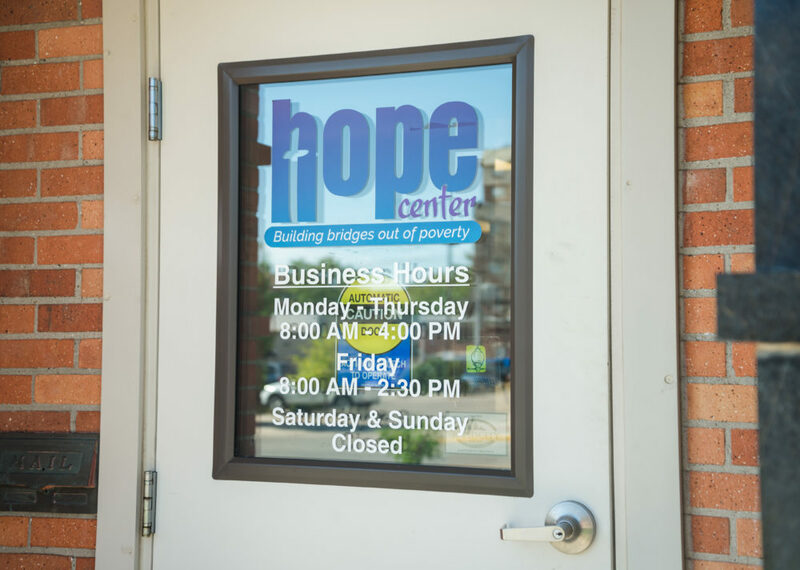 ➤ The HOPE Center is seeing an increase in the number of people they serve, which means more and more people in our community are living in poverty and without homes. In the U.S., there are 3.5 million Americans that will be without a home this year, with 1.36 million of them being children. Many people are one emergency away from being homeless. The HOPE Center helps people build bridges out of poverty. You can help make a difference. ➤ Families with children are the fastest growing segment of the homeless population. According the Rapid City Schools, there are 470 children identified as being homeless in Rapid City. These children have no place to do homework, take showers, wash clothes or sleep. School should be about learning, but it’s hard to learn when you’re worrying about where your next meal will come from. The HOPE Center assists families achieve housing and provide other essential items that help make stable families. ➤ More than 2,042 people who live without homes and have no stable address get their mailed delivered to the HOPE Center. 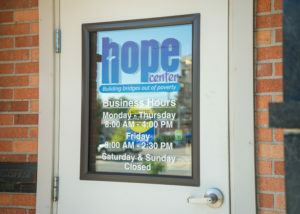 They use the Hope Center’s address for ID’s, job applications, and other important documents. Your support of the HOPE Center allows them to continue providing this crucial service. ➤ The lack of shelter and the ability to rest, eat right, take medicine and having good hygiene prolongs illness in people who are homeless. Many times people become sick and stay sick for longer periods of times, sometimes leading to life-threatening situations. At the HOPE Center, they provide their guests with a warm place where they can rest during the day while helping navigate through the process of getting housing. ➤ Sickness takes a toll on people who are homeless. They are 3 to 6 times more likely to be sick and many die from illnesses that can be prevented and treated. 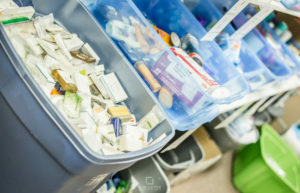 The HOPE Center provides shelter from inclement weather, hygiene items, laundry services and first aid supplies that help people stay warm, clean and dry to help prevent illnesses from becoming life-threatening. Homelessness decreases a person life expectancy. On average, many people without homes die in their 50’s, while people with homes can expect to live to 78. ➤ Through October, 2016, the HOPE Center provided 3,487 hygiene kits to their guests. These include soap, shampoo, conditioner, lotion, toothbrush & toothpaste, razors, deodorants and socks. All of these items were donated by people in our community and the surrounding area. ➤ The HOPE Center’s “Soap for HOPE” Laundry Facility allows people who have no access to laundry facilities a place to wash and dry their clothes. Since May, 642 people have washed and dried 1,092 loads of laundry. Your donations of laundry soap and dryer sheets help make this possible. ➤ More than 10% of Rapid City’s population lives at or below the poverty level. Many of these people are “working poor” – people who have low paying jobs and struggle to provide housing, food and clothes for their families. The HOPE Center provides critical services that help families fill in the gaps that their paycheck doesn’t cover. ➤ Even people who are employed live below the poverty level. They live in shelters, have minimal housing, or live on the streets. 44% of HOPE Center guests have jobs, but still need their services. ➤ The HOPE Center strives to help their guests make positive changes in their lives. So far in 2016, they have helped 26 guests find employment in our community. ➤ The HOPE Center staff assists our guests as they work with landlords and other agencies who help people get settled in their own home. 21 guests of the HOPE Center obtained housing in 2016. ➤ So far in 2016, the HOPE Center staff has assisted 22 people to achieve sobriety. They work with guests by counseling with them, working with them to find treatment programs, by providing an Alcoholics Anonymous group two days a week, and through love and support as guests make better choices in an effort to stay sober. ➤ There are more than 50 disabled veterans who are homeless living in Rapid City. Many times, they have physical or emotional issues from their military service that keep them from finding work or cause crisis in their families. ➤ In order to better serve their guests, the HOPE Center collaborates with other social service agencies, including Volunteers of America, the Black Hills Regional Homeless Coalition, the Rapid City Area Youth Task Force, Cornerstone Rescue Mission, Working Against Violence, Inc., Feeding South Dakota, and numerous others. These agencies work together to break the cycle of poverty that can lead to homelessness. ➤ The HOPE Center share’s God love with their guests by offering daily devotions and prayer time, a weekly bible study, and words of encouragement and grace to all who come for services. They honor Lakota spiritual traditions and support everyone as they travel on their personal spiritual journey. ➤ Homelessness is a very real struggle for people who have small children. Many times, families are separated because of addiction, emotional issues, and the stress of living on the streets. The HOPE Center works with parents and helps them improve their parenting skills and their relationships with their children. With better parenting, and assistance in other areas like housing and jobs, families can be reunited. In 2016 they have helped 31 guests improve their parenting skills. ➤ The HOPE Center’s Mentoring Program currently has 5 active mentoring relationships. The mentors meet with their mentee once a week to offer encouragement, friendship, wisdom and counsel. Would you have some time to spare to help one of their guest build a better life? If so, give Leticia a call at 605-716-4673 and volunteer! ➤ The HOPE Center also provides bus passes to their elderly, sick or handicapped guests so they can get to medical and other necessary appointments. They are always in need of bus pass donations – you can get a card with 10 bus rides for $13 at the bus depot downtown on 6th Street. The staff and volunteers of the HOPE Center develop relationships with their guests. We offer counsel, friendship, trust, love and grace. They watch them grow, get jobs, find housing and work toward a better life. In other words, they become a family!